The GOES-R Satellite System Module and Core Module subassemblies were successfully mated and now form the GOES-R spacecraft. This is an important milestone in the development of the satellite, as it merges together the elements that form both the “brain” and the “body” of the satellite that will be launched in early 2016. The Geostationary Operational Environmental Satellites – R Series (GOES-R) is the next generation of geostationary Earth-observing systems. 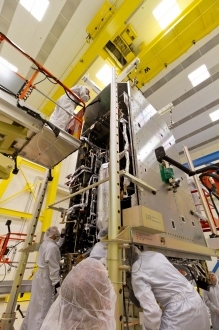 This process brings together these two primary subassemblies of the satellite before the GOES-R spacecraft begins environmental testing later this year. More than 70 electronics boxes mounted within the System Module provide the functionality to operate the spacecraft and its six instruments. The Core Module forms the main central structure of the satellite and carries the propellant needed to maneuver the spacecraft after it is separated from the launch vehicle and operational in geostationary orbit. The system module of the A2100-based satellite houses more than 70 electronics boxes that comprise the three major electrical subsystems; command and data handling, communication, and electrical power. The propulsion core contains the integrated propulsion system and serves as the structural backbone of the satellite. The propulsion subsystem is essential for maneuvering the GOES-R satellite during transfer orbit to its final location, as well as conducting on-orbit repositioning maneuvers throughout its mission life. With the mate successfully completed, the GOES-R Series Program team will move forward with the integration of the Earth Pointing Platform (EPP) onto the spacecraft. The EPP will support the Advanced Baseline Imager (ABI) and Geostationary Lightning Mapper (GLM) instruments, as well as the star trackers and inertial measurement units used to precisely measure the attitude and location of the satellite in space. The GOES-R Series will be more advanced than NOAA’s current GOES fleet. The satellites are expected to more than double the clarity of today’s GOES imagery and provide more atmospheric observations than current capabilities with more frequent images. 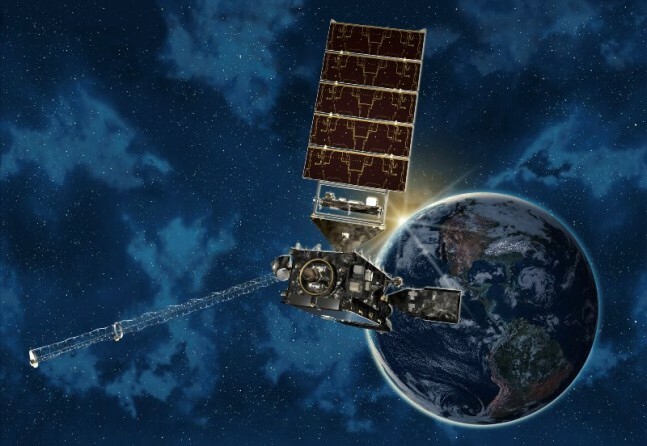 The advanced spacecraft and instrument technology on the GOES-R Series satellites will result in more timely and accurate weather forecasts for NOAA’s National Weather Service. It will improve support for the detection and observations of meteorological phenomena, including severe storms and hurricanes. The enhanced data from GOES-R will directly affect public safety, protection of property, and ultimately, our nation’s economic health and development. NOAA manages the GOES-R Series Program through an integrated NOAA-NASA program office, located at NASA’s Goddard Space Flight Center in Greenbelt, Maryland. NOAA’s mission is to understand and predict changes in Earth’s environment, from the depths of the ocean to the surface of the sun, and to conserve and manage our coastal and marine resources.